In a blunt and detailed analysis of Nokia, the company's new chief executive told employees that Apple's iPhone and Google's Android phones have left his company in the dust. Nokia, still the world's largest phone manufacturer by volume, has seen its smartphone market share eroded over the past few years by rising stars such as the iPhone and the Android army. Nokia chief executive Stephen Elop wrote in a memo leaked by Engadget that "the first iPhone [was] shipping in 2007, and we still don't have a product that is close to that experience. Android came on the scene just over two years ago, and this week they took our leadership position in smartphone volumes. Unbelievable." Elop, who was named Nokia's president and CEO in September, identified in a 1,300-word memo the main problems the company is facing, "while competitors poured flames on our market share." "We fell behind, we missed big trends, and we lost time. At that time, we thought we were making the right decisions; but, with the benefit of hindsight, we now find ourselves years behind," Elop wrote. The Nokia CEO recognized Apple's iPhone was a game changer: "Apple demonstrated that if designed well, consumers would buy a high-priced phone with a great experience and developers would build applications. They changed the game, and today, Apple owns the high-end range." At the same time, Google is cutting deep into Nokia's former strengths, Elop notes: "Android came in at the high-end, they are now winning the mid-range, and quickly they are going downstream to phones under $135. Google has become a gravitational force, drawing much of the industry's innovation to its core." The problem with Nokia is that it doesn't bring enough innovation to the market, according to Elop: "We thought MeeGo would be a platform for winning high-end smartphones. However, at this rate, by the end of 2011, we might have only one MeeGo product in the market." Symbian, the mid-range platform, "has proven to be noncompetitive in leading markets like North America" too. 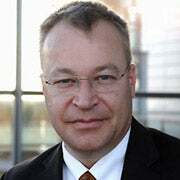 In a stark warning, or just clear vision of the future, Elop wrote of Nokia that "if we continue like before, we will get further and further behind, while our competitors advance further and further ahead. [...] And the truly perplexing aspect is that we're not even fighting with the right weapons. [...] Nokia, our platform is burning," Elop warned. Elop is expected to announce a new strategy on Feb. 11, in a "huge effort to transform our company." While no official details have been yet made available, it is rumored that Elop, a former Microsoft executive, would put the new Windows Phone 7 operating system on a new breed of Nokia devices.